Our 60 minutes full-body oil relaxation massage is designed to increase blood flow through long gliding strokes employed in the direction of the heart. Conclude the experience with Japanese tea at the end of the massage treatment. $100 Gift Certificate usable for all Onsen Ma experiences. 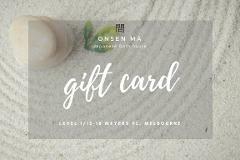 $150 Gift Certificate usable for all Onsen Ma experiences. $200 Gift Certificate usable for all Onsen Ma experiences. $250 Gift Certificate usable for all Onsen Ma experiences.